I’ve spent the last 40 years as a boater, and I certainly enjoy spending time on the water. I live part of the year in the Florida Keys, and that’s where I keep Pirate Booty – the Gulf Star Viking boat I’ve owned for several years. Earlier this year, when news broke that Hurricane Irma could be heading toward Florida, I was understandably concerned. But I took the necessary precautions and made sure my boat was secured at the marina and prepared for the worst – even while I held out hope that the massive storm would shift course. Unfortunately, that didn’t happen, and Hurricane Irma made landfall in the Keys on September 10. While Pirate Booty didn’t emerge unscathed, it fared much better than most. The canvas got ripped off the bridge, some of the hatches were opened up, and a few of the power systems were destroyed. But the tie-downs held and the hull and major components of the boat were unharmed. However, with some of the hatches blown open, the hurricane brought a significant amount of rain with it, allowing a lot of water to get caught in the bow of my boat. In the four weeks after the storm passed, my son and many helpful neighbors and friends provided welcome assistance to begin the process of restoring Pirate Booty to her former glory. They secured the hatches, fixed many of the electronics systems, and inspected the boat for other damage – all while it remained safely secured in the marina. When it came time to remove the excess rain water from the bow area, we called a popular maritime salvage and towing company to bring a pump and remove the water. I have a membership with this company, and while I didn’t expect the service to be free, I expected to be charged a reasonable rate for the service. 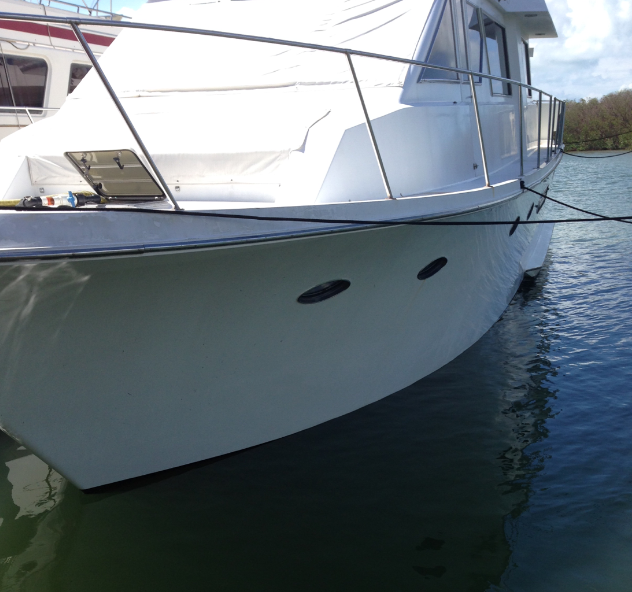 As you can see in the photo (taken well after the storm but before any water had been pumped out), my boat was sitting lower in the water than normal, but was nowhere near sinking and was certainly not in any peril. My boat wasn’t even sitting below the boot stripe in the bow. When the representative of the salvage company arrived in late October carrying a small pump in the back of a pickup truck, he hopped onboard, plugged his pump into my boat’s electrical system, and began the straightforward two-hour process of draining much of the water out. I recognize that this storm destroyed many boats, especially in the Keys. In the aftermath of the hurricane, many salvage operators stepped up to provide a vital service that helped save damaged boats that were truly in need of saving – but my story is very different. I fully support legislation that would require maritime salvage and towing companies to give boaters a written estimate prior to providing service. Had I received an estimate, I could have made an informed decision and looked at options that wouldn’t have cost so much. The current lack of consumer protections allows – and even encourages – a form of modern day piracy that should not be a reality in Florida or anywhere else.